Spokesman: "Not in South Africa's interest for him (Dalai Lama) to attend"
JOHANNESBURG, South Africa (CNN) -- South Africa has refused the Dalai Lama a visa to attend an international peace conference in Johannesburg this week, a presidential spokesman said. The Dalai Lama fled China in 1959 after a failed uprising against Chinese rule. The Tibetan spiritual leader and Nobel Laureate did not receive a visa because it was not in South Africa's interest for him to attend, said Thabo Masebe. South Africa thinks that, if the Dalai Lama attended the conference, the focus would shift away from the 2010 World Cup -- the global soccer championship it will host next year. "We cannot allow focus to shift to China and Tibet," Masebe said, adding that South Africa has gained much from its trading relationship with China. Former president F.W. De Klerk, another laureate, backed Tutu, saying in a statement that he would also not participate in the conference if the Dalai Lama remained excluded. De Klerk said that the decision to refuse the visa made a "mockery" of the peace conference. "The decision to exclude the Dalai Lama is irreconcilable with key principles on which our society is based including the principles of accountability, openness and responsiveness and the rights to freedom of expression and free political activity," he said. "South Africa is a sovereign constitutional democracy and should not allow other countries to dictate to it regarding who it should, and should not admit to its territory - regardless of the power and influence of the country." A representative of the Dalai Lama said he was not surprised by the decision. 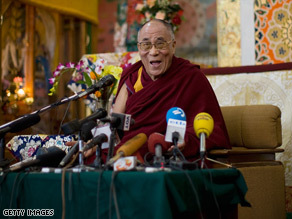 The Tibetan government in exile thinks that China has pressured many countries to refuse a visit by the Dalai Lama, according to Chhime Chhoekyapa, an aide in Dharamsala, India. The peace conference was billed as an opportunity to showcase South Africa's role as a human-rights champion ahead of its hosting of soccer's World Cup next year. It was to bring together Noble Laureates and top soccer officials. In addition to Tutu and De Klerk, laureates Nelson Mandela and Martti Ahtisaari, Sepp Blatter, president of soccer's international governing body, and actress Charlize Theron were invited to attend. The event had the blessing of the Nobel Committee.